Analytical Chemistry: An Indian Journal is an open access journal that publishes original research articles, review articles as well as letters in all areas of analytical chemistry. The journal is intended to provide a platform for scientists, academic researchers, students at research institutes, universities, and other educational establishments and analysts working in industry, agriculture, medicine services to discuss various new issues in Analytical chemistry. The topics covered include but not limited to: Mass Spectrometry, phase of analytical operations, bioanalysis, Electrochemistry, Voltammetry, environmental analysis, separations, spectroscopy, chemical reactions and selectivity, Analytical Chemistry Techniques, chromatographic techniques, surface analysis, and Spectrometry, analytical instrumentation, biomedical analysis, biomolecular analysis, biosensors, chemical analysis, chemometrics, clinical chemistry, drug discovery, environmental analysis and monitoring, food analysis, forensic science, laboratory automation, materials science, metabolomics, pesticide-residue analysis, pharmaceutical analysis, proteomics, surface science, and water analysis and monitoring. Analytical Chemistry: An Indian Journal welcomes the submission of original articles, reviews, short communications, rapid communications, letters to the editor, abstracts, addendums, announcements, article-commentaries, book reviews, annual meeting abstracts, case-reports, discussions, meeting-reports, news, orations, product reviews, hypotheses, and analyses in all areas of Analytical Chemistry. 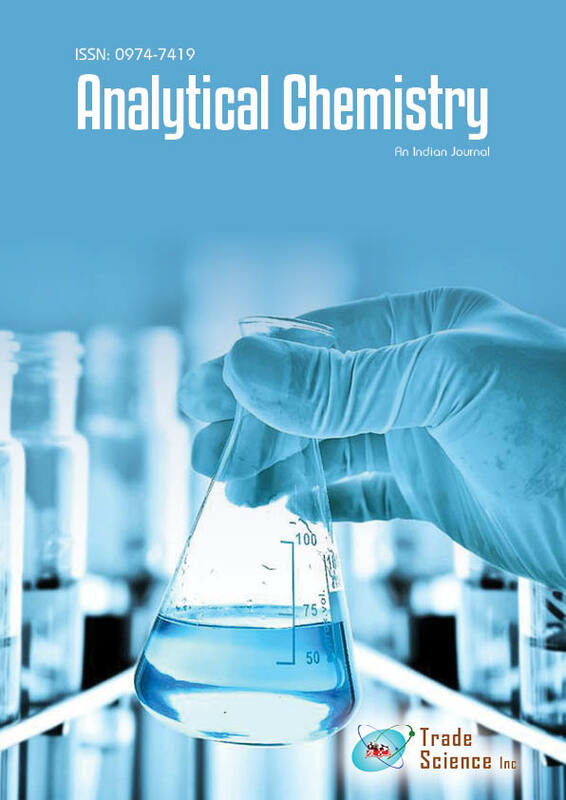 Analytical Chemistry: An Indian Journal publishes twelve issues per volume every year. The journal encourages students, graduate students, postgraduate students, postdoctoral students, recent graduates, teachers, academic researchers and practitioners to submit their articles for publication consideration. This paper reviews the use of the domestic microwave oven as a rapid processing multi-task prototyping tool. The investigation includes the use of these ovens for both plasma and non-plasma .. The concentration of fluoride in common dentifrices can be found using various methos. An ion selective electrode can be used to continuously measure the concentration of fluoride in various.. In this paper we are presenting the remarkable TiO2 nano photocatalytic material. The TiO2 nano thin flms were deposited on glass substrate using PV-EBE method as well as sol-gel spin coatin..
A new stability-indicating chromatographic ultra-performance liquid chromatography (UPLC) method has been developed and validated for determination of Perindopril Arginine (PER) and Amlodipi..
A simple, rapid and sensitive flow-injection chemiluminescence (FL-Cl) method has been developed for the determination of ketamine (KT) in urine; strong chemiluminescence (CL) signal was pro..